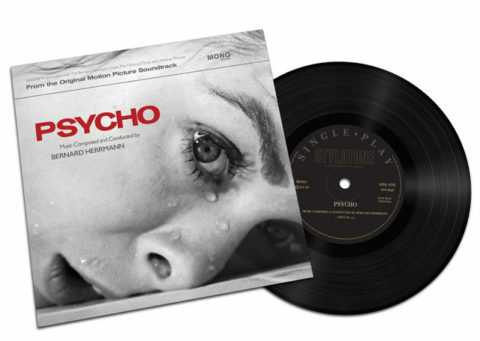 Soundtrack label Stylotone have issued a seven-inch vinyl record that features one of the world’s most famous films cues – Bernard Herrmann‘s music to Alfred Hitchcock’s 1960 horror classic, Psycho. 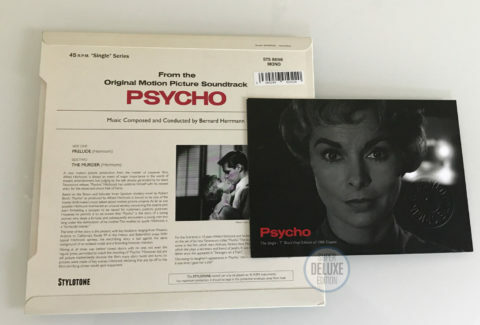 Specifically, the single contains the cues Prelude which opens the film and accompanies Saul Bass’s main titles and (on the B-side) The Murder, the soundtrack to that shower scene that has inspired countless homages and parodies. What’s worth highlighting is that these have been taken from the original master tapes – long thought lost – which have been located by Stylotone and have been assembled, mastered and cut by Sean Magee at Abbey Road Studios. This is a limited edition of 1960 copies (geddit?) and like all Stylotone releases comes exquisitely presented. This features laminated front cover and fold-over flaps, non-laminated rear with the barcode present only as a removable sticker. It also comes with an embossed collectors’ postcard featuring film artwork. Even more exciting than this is that Stylophone have produced just 100 promotional copies of this seven-inch on ‘blood spattered’ clear vinyl! SDE has one of these highly desirable promo items to give away, so make sure you enter our competition. The black vinyl release of Psycho is out now and can be ordered from Stylotone’s online store. I’m just wondering if they used an all-analog chain in cutting the lacquer. Abbey Road definitely has that capability (they can even do a direct-to-metal master, but I don’t think the guy who cut the Psycho 7″ is the guy who usually engineers using that lathe). It’d be silly to use a digital master created from the tapes and then use that to cut the lacquer, but who knows? I got mine from Norman Records for £10 delivered. Sounds like they really do mean the original soundtrack, not the re-recording, because they use those words specifically. The “original film soundtrack”. I agree with others that they should release the whole thing! Although these two cues are certainly the best of the whole score. Thanks for the contest heads up. Wish me luck. I do wonder if this means we’ll be seeing some sort of release of these original master tapes? Like of the full score that Herrmann recorded, versus just these two tracks. Presumably that will come… although Stylotone are taking their time with the various soundtrack releases. The cover graphics and layout is lovely. A throwback style with a photo that I don’t think would have been acceptable back in the day. If I still had a turntable, I’d get this just for the design. If that Fopp vinyl is a Doxy release, then I wouldn’t bother. The audio used for the Doxy releases has a very poor reputation among soundtrack collectors, as far as I’m aware. As this Stylo release appears to use a different source and a new master with the blessing of Bernard Herrmann’s estate, it should be a vast improvement. Don’t worry, I know that pain!! I have that red Doxy or DOL pressing of the soundtrack – mostly bought it cheap because I love the sleeve artwork. Quality-wise it sounds like someone taped the music as the film played. Cheers Paul. Ordered!! One of the greatest films and film scores of all time….and I don’t even have a record player. I really like the effort Stylo’ put in to their releases. So authentic and high quality. Ever since you first featured them on SDE Paul I have been back to their website to see what is going on. If only they released a soundtrack I actually liked! Ordered! Thanks Paul and I’ve entered SDE Competition and hope to get the colored limited edition disc too. 100 “promotional” copies for a limited edition release of 1,960?? Thanks for the opportunity Paul. Whoops, should be on Competition post, not this one. a classic score and what an excellent release! Oh for that coloured vinyl version! !